EVERY time you walk into a Westfield shopping centre you are being tracked. Sophisticated facial detection software, working in conjunction with the devices you are carrying on you, are monitoring your mood and tracking your every move. The company uses small cameras fixed atop advertising screens, that detect individual faces in order to record the age, gender and mood of shoppers. Westfield also tracks shoppers' movements by pinging their Wi-Fi enabled devices with routers littered across its centres. This means that Westfield is able to understand where a shopper entered the centre and what stores they walked past, and it is able to do all of this without the express consent of shoppers. Westfield would not comment on particular details about advertising panels, which it calls the Smartscreen Network. But the French software firm, Quividi, which developed the technology behind the cameras has stated that they are able to detect the mood of shoppers, in a range from very unhappy to very happy, the age and gender of shoppers and how many times the screens were viewed and for how long. Quividi stresses that none of the data it collects is used to identify individuals and emphasises the technology is "face detection," not facial recognition. An image, taken after one of the panels at the Belconnen Westfield in Canberra malfunctioned, has revealed how the panels look from the other side. Westfield's Smart Screen captures your movements as you shop. The image shows Scentre Group and Brandspace branding as well as an ID number for the unit and another ID number for the face. It also shows whether the 'Quividi Link' is on and the firmware version of the panel. 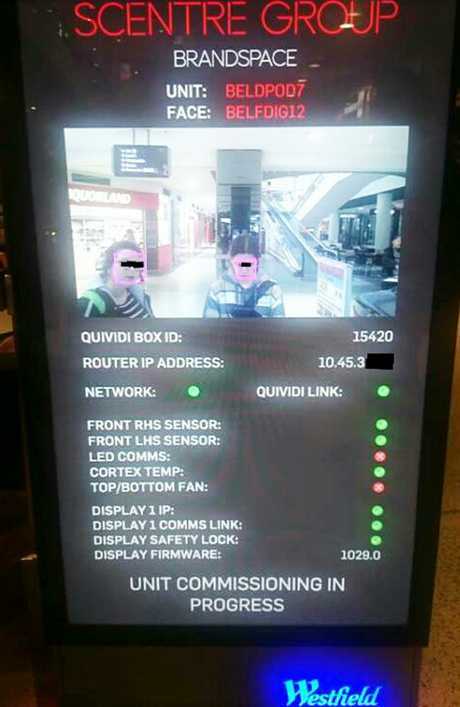 The two people in front of the panel have purple boxes around their faces, indicating that this is real-time facial detection in practice. 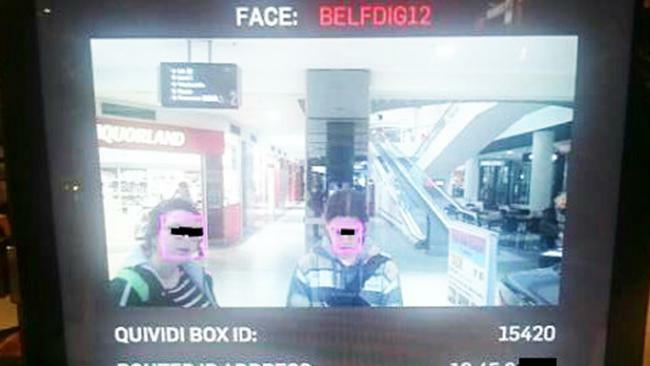 The photographer chose to add black boxes over their faces and the public IP address used by the software. A company spokeswoman said the data collection was designed to improve Westfield's shopping centres. "We collect data primarily to effectively manage and operate our Westfield centres," she said. "Our intention with any data that we collect is to be able to better understand our customers' needs, and connect them with retailers in a more meaningful way." A spokesman for the Office of the Australian Information Commissioner said the Privacy Act 1988 only regulated the collection of personal and sensitive information - which meant Westfield did not need the express consent of shoppers to collect this data. But the absence of express consent has privacy advocates worried. Tim Norton, the Chair of Digital Rights Watch, said collecting data of shoppers was dishonest. "Yes, there's an argument there about making their experience better so that your shopping experience can be more targeted - that is a useful metric and is a useful service," Mr Norton said. "But unless the user is actually OK with that and they sign off on: 'Yes I want to give you more data so that you can make my shopping experience better,' than it is underhanded. "So I think that needs to be taken into account." Mr Norton called for Westfield to be more clear about what data they collect. "They need to actually be very upfront and transparent about what they're tracking and be open to their customers about that information," he said. "It's about how you're actually presenting that back to the customer … are their customers aware of exactly what is being tracked, and for what purpose it's actually for?"